Tannoy, a brand synonymous with excellence in monitoring has just announced the release of the TM1 – a large diaphragm studio condenser microphone. The Tannoy TM1 promises to be a high quality all rounder, suitable for capturing a range of sounds. In the past, Tannoy created ribbon microphones but the English company became famous for their loudspeakers (and are championed by mixing legend Andrew Scheps), but they’re bound to make a splash with their first ever condenser design. The TM1 has a large-diaphragm design, with an aesthetic reminiscent of a Neumann U-87 and hopes to achieve a similar degree of versatility. It features a one-inch gold-plated diaphragm and the heavy duty shock mount is a welcome touch. 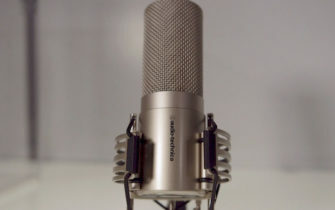 The TM1 is slated for release in August/September and should come in at $150, a very competitive price for a mic of this quality. Visit Tannoy website for more details.